It was always fun talking will Bill. He was full of endless stories. But of course he could go on, and on (and on). Sometimes he was difficult to escape from, and one could be "trapped" in a corner at a party while Bill waxed seamlessly from one topic to the next. I learned it was good to meet him in the hallway on my way to class. That way I could have a pleasant five-to-ten minute conversation with him, and then have a polite way to excuse myself. Bill’s love of mathematics was never far below the surface. He was a rich storehouse of intriguing problems. Some of my favorite memories of him are when, in the middle of a lengthy hallway or party conversation, he would switch topics and say "Have I ever shown you the problem about …?" This would always be accompanied by a wonderful grin and twinkle in his eye. He would produce a barely sharpened pencil and a scrap of paper from some pocket, and proceed to share a mathematical gem. I often wished I could have taken notes, but that would have ruined the spontaneity. Sometimes I would manage to keep the scrap of paper, but I really wish I had Bill’s ability to simply carry good problems around in my head. There is one aspect of Bill’s career at Wabash that is less known outside of the math department: his hosting of the Wabash Functional Analysis Seminar. Functional analysis is a fairly narrow branch of research-level mathematics. Sometime in the late 1960s, there were a number of functional analysts at Purdue, IU, and the University of Illinois at Urbana-Champaign. They wanted to meet on a regular basis, but driving to each other’s campuses was a bit too far. They called the Wabash mathematics department wondering if the College would be willing to let them meet there. Bill was delighted, and he hosted it from its beginning until he retired in 1990. The seminar’s heyday was during the 1970s and 1980s. Aided by Bill’s good humor and Ellen’s cookies, it met on Saturdays once a month during the school year. 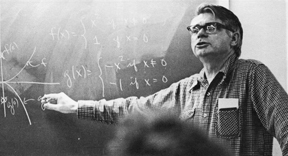 Many well-known mathematicians gave cutting-edge talks in Baxter 111 during those years. There are not many functional analysts in the world, but for those whose careers spanned those two decades, if something took place at the Wabash Seminar, it was worth taking note of. In his autobiography, "I Want to be a Mathematician," Paul Halmos (one of the founders of the Wabash Seminar and a household name to mathematicians worldwide) wrote some very kind paragraphs about Bill and the College. The seminar still meets, but the vast majority of its participants from Bill’s time have either retired or moved on to other schools. It now has two larger weekend meetings a year at IUPUI, and meets only two or three times a semester at the College.